Injuries from slips, trips and falls are likely to occur due to the frequency with which employees are exposed to the hazard. Well-maintained floors and a good cleaning program can help reduce slip, trip and fall hazards. Employee involvement is vital to slip, trip and fall prevention, stakeholders say. People may not think strolling down the hall to a meeting or taking the stairs to visit the purchasing department is very hazardous. After all, they have been walking for most of their life. However, despite decades of experience performing this simple act, thousands of workers are injured on the job every year from a slip, trip or fall. In 2011, slips, trips and falls were the second most common event or exposure leading to a work injury or illness (behind overexertion/bodily reaction), accounting for an incidence rate of 29.7 injuries per 10,000 full-time workers, according to the Bureau of Labor Statistics. These injuries carry a steep cost. Combined, falls on the same level and falls to a lower level were the No. 1 cause of all disabling injury costs in 2010, representing one-quarter of the total and costing employers nearly $14 billion, according to Liberty Mutual Research Institute for Safety in Hopkinton, MA. Injury figures related to slips, trips and falls seem to suggest that workers still have not quite mastered walking. Adding to the problem is that because people walk so much, they may not necessarily be thinking about the task of walking, according to Kevin Pfau, another senior safety management consultant at SAIF Corp. As a result, people can become distracted – similar to how they can while driving – and stop paying attention to hazards. Some employers may not recognize slips, trips and falls as being a risk to workers, even though those same employers – particularly in the retail industry – are likely very careful to prevent their customers from being exposed to such hazards. For example, Pfau described a situation in which a milk carton is spilled in a grocery store – employers are alerted to the aisle for cleanup to prevent shoppers from slipping and falling. However, he said, when it comes to employee areas, that same type of alarm is not always sounded. Pfau said some employers may have a tendency to blame the worker for falling – because he or she is overweight, not paying attention or just plain clumsy. Although several stakeholders acknowledge that employee inattention plays a role in the occurrence of slips, trips and falls, it is only one aspect. Bill Balek, director of environmental services at ISSA, a Lincolnwood, IL-based cleaning industry association, said physiological characteristics of the walker, such as his or her age or physical disabilities, can lead to slips, trips and falls, and he believes an employer cannot control these factors. 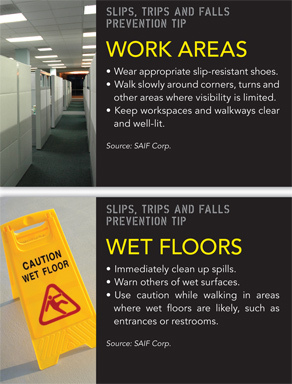 Employers can take several steps to mitigate the risks of slips, trips and falls. Nusser said that although workplace floors should have good slip-resistant qualities, many organizations put little thought into flooring when remodeling. He recalled visiting a food product warehouse in which the owner had installed a polished concrete floor so slippery it caused forklift wheels to spin on the floor. “Had they done a little more planning ahead of time, they could have put the right floor in and reduced the hazard,” Nusser said. Select a walkway surface material that will perform well under expected conditions, Norton said. For instance, certain surfaces are very slip-resistant when dry or clean but can lose some of those properties when wet. Poorly lit environments also contribute to slips, trips and falls. Employers should conduct a lighting evaluation to determine if surfaces can adequately be seen indoors, outdoors and at night, Norton said. A combination of mats may be needed on slippery surfaces, such as one to remove debris and another to remove moisture. Although mats can be an effective tool in a slips, trips and falls prevention program, they must be used properly, Norton stressed. Employers should ask employees what types of mats are needed, where the mats are needed and how long the travel distance is. Additionally, employers should ensure a good maintenance program is in place for the mats, which can become saturated with water or develop worn edges. A good self-inspection program to maintain floor condition is necessary, including one ensuring walkways are free from objects that could cause a slip, trip or fall. But an effective floor- and housecleaning program is important as well. Ask the floor manufacturer about the best way to clean the floor. Norton said failing to follow instructions for cleaning chemicals is a common mistake. When a spill occurs, workers generally do a good job of placing warning signs around floors that are wet and being cleaned, Nusser said. The problem, he added, is that some people may leave those warning signs up long after the floor is dry, leading other employees to begin ignoring the signs. Employee footwear is another often-overlooked factor in preventing slips, trips and falls. Pfau acknowledged it may not make much sense for some worksites, such as office environments, to pay for shoes. In those situations, he said, employers should educate employees on how to recognize when their shoes are unsafe. However, he added, company rules may be necessary to ensure safe footwear is worn. For example, employers can limit the height of heels worn in the workplace or ban flip-flops, and should recommend that workers who wear high heels or dress shoes switch to tennis shoes while walking to and from the parking lot. Different jobs may call for different types of footwear. 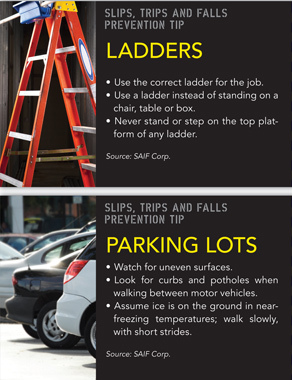 A SAIF Corp. guide on preventing slips, trips and falls notes that landscapers should probably use a shoe or boot with deep tread and large cleats. In general, employees should be educated on wearing footwear that more closely resembles a tennis shoe, as such shoes are likely to provide better grip and prevention from slips, trips and falls, Nusser said. Stairwells are another area with serious risks for slips, trips and falls. Pfau recommended hanging posters that demonstrate how to hold the handrail properly and discourage employees from running up or down the stairs. Provide adequate lighting in stairwells, and ensure steps have a good grip and are maintained, he said. Train employees on how to properly use the handrail. The SAIF Corp. guide recommends turning 30 degrees toward the handrail when using the stairs. In the event of a fall, most people fall in the direction they are facing, so this positioning would send the person into the rail instead of down the steps. Employers can make several small changes to minimize slip, trip and fall hazards, said Nusser, citing as an example one worksite where new, improperly trained janitorial workers mistakenly believed adding more of a certain chemical to a cleaning solution would make the floors cleaner. Instead, the solution left a slippery film on the tile. However, once the employer provided training on the recommended amount of cleaner, the floors became less slippery, Nusser said. Simple solutions such as this can come from having discussions with employees about hazards in the workplace and what can be done to prevent them, Nusser said. Such buy-in from employees – and upper management – is similar to how any safety issue should be approached, Nusser said. To create a safer environment free of slip, trip and fall hazards, employers need to instill a culture change, he added. Such a culture change is not limited to any particular industry. When SAIF Corp. found out that it needed to reduce its own slip, trip and fall incidences, it created a buy-in program within the organization, starting from the top down. “We set some expectations for our office employees, and we all as a group are holding each other accountable, and that has reduced our slips, trips and falls here at SAIF,” Pfau said.